Staring at the television in my living room, I was jotting down the things to pack and my mind was paralleling thinking about the tasks to complete before I step out for the long weekend. In the mean while I was hungry for lunch. It was twelve past ten and yes, an early lunch. Not wanting to disturb my son who was sleeping in the crib, I walked on the edge of my toes to kitchen to fix some food that has low glycemic index . Yes, I am on South beach diet for the last 2 weeks and hence I have not been regular to my space as I was reading a lot about this diet and initially I was skeptical whether I would be able to stick through the process. Yay! I finished a successful phase 1 but I am going to stick with the same phase for little longer. Now I am excited to share my experiences with you all and especially to those who are struggling with weight loss. I will also post the recipes I created following the book. One thing which I learned over the years is never ever listen to mom/grandmothers/aunts/sister (only with regards to dieting guys!! Please don’t read in-between the lines :-)) unless they are professional qualified to guide with food choices. Till date, my mother doesn’t approve of South beach diet. She says eating rice is very important and only then you will have the stamina to do daily chores. She believes that Indian food is nutritionally well balanced than any other cuisines. Yes, I side her but there are choices to be made within the Indian foods and there is no doubt that our menu is so well balanced. I am not here to promote one cuisine and degrade others. But one thing is for sure, I can never agree on eating pongal for breakfast these days- It has just carb, carb and carb in it. Another famous Indian breakfast is puri with potato curry – This is much worse than pongal. I used to love all these starchy dishes and have eaten then while I grew up but now with a target to reach, I am no way going to them. This is where I talk about making choices. Whole grain idlies or buckwheat upma or whole wheat dosa are few dishes that could be incorporated while you are on a diet. One incident which I remember till date is. When my mom came here towards the end of my pregnancy, I was following a diet plan as I had gestational diabetes. The very next day after her arrival, she suggested to try idlies and I was skeptical as my dietitian and doctor have scared me enough on what will happen if your sugar level shoots up with bad carbohydrates. I gave it a thought and also the South Indian blood in me was craving for a breakfast cooked by mom. I ate just 2 idlies. I took my blood test after 1hour and it went to 172mg/dl. I panicked and so was my mom. She then announced, just stick with the diet your doctor had suggested and lets not play with my food as there is a baby involved. Then slowly during her stay for the last 6 months, she slowly understood the difference between good and bad carbohydrates and how to play around when you plan to shed some weight. Her verdict when she left was “Umm even your choice of food are tasty to the tongue and light to the stomach”. When hungry, I get terrible headaches, become moody and cann’t think straight. I am sure that’s the case with most of us. For people like me, this diet would be super exciting as we get to eat 5 times a times, 3 meals and 2 snacks. There are 3 phases in this diet and they have given the lists of food to enjoy and the list of food to avoid in each phase. They say that first 2 weeks are the toughest as we need to avoice rice, pasta, bread, corns, carrots, beets, peas and potatoes. As I said in the beginning of my post, I failed when I started this diet in 2009 but over the months, I read a lot on what to eat, how to make delicious meal, tweak other cuisines in a way that suits our Indian palate without breaking the rules of the diet and how to incorporate Indian dishes to it. So this time, there is no looking back and I am loving the food and my husband has now joined hands with me after seeing the weight I lost in just 2 weeks. Apart from this diet, I also do cardio circuit with few DVDs I bought and once a while, I do swimming too. But the workout parts has been quite sporadic as it revolves around my son’s sleeping schedules and my cooking schedules. One thing I learnt to be successful in this diet is to plan and cook ahead. We could freeze few foods too and also I forgot to tell you, there is also dessert in this diet. I have just tried making their granula and its yum-o-good. The post for today is Bok-choy shrimp (Phase 1 dish). I have never cooked with bok-choy , so I asked a fellow Asian shopper on how to cut them.She suggested just clean ans use the entire plant (both bulb and leaves). When I found this recipe, I was curious to try my hands on it and I cooked it right away. Such a simple dish, very tasty and quite filling too. You could add little more water and serve it a heart-filling soup as well. 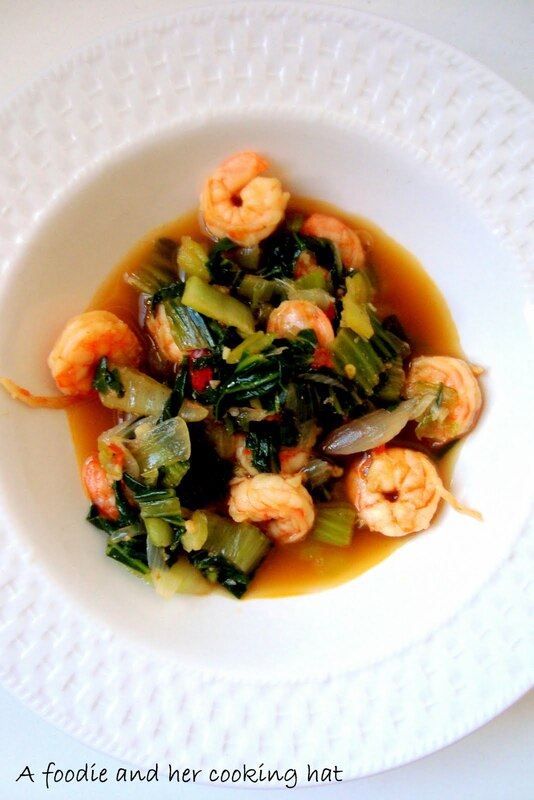 I ate bok-choy shrimp with raddichio-endive salad and later for dessert had 1 tablespoon of South beach diet granula with 1/4 cup non-fat yogurt. Thaw the frozen shrimp in hot water or refrigerator overnight or if using the fresh ones, clean and de-vein. Set them aside. Heat oil in large wok and add garlic, cook for 30 seconds. Throw in the chilli flakes and onions, cook for another 2-3minutes. Add the shrimp and cook for 5 minutes. Remove and set aside.To the same wok,add the chopped bok-choy and soy sauce and cook till tender for 5 minutes. Mix in the shrimp mixture and salt to taste. Stir and serve with any salad of your choice. Loved ur write-up, quite informative. Looking forward for some more dieting tips and recipes. I cant even imagine dieting, love the way u written about this South Beach diet, truly sounds interesting and pulling me to try, looking forward for some more interesting recipes and definitely useful tips..Btw bokchoy shrimp looks delicious..
Luv the note on pregnancy diet,the toughest and best phase,every women wud luv to have in her life..Thank you for bringing this post to my notice even i am off with blogging…Definitely loads of veggies do help us to shed the extra kilos..
Congrats on the 2 successful weeks Viji!!! And good luck on your weight loss journey!